On April 2nd the class of 2015 got its official start. Unofficially, 9 of these 13 trainees have been participating in chapter activities since last September. There were two field trips (Entomology and Saw Whet Owl) along with two training presentations (The Gestalt of Weather thanks to Kate Guenther and A Presentation in Your Pocket compliments of Gail Napora) and it culminated in a trip to the Smithsonian Museum of Natural History in D.C. for a behind the scenes tour of two collections: Birds and Mammals. Of the thirteen new trainees, 11 were able to make the day trip to D.C. for which we can thank Byron Hukee. I think we will be thanking Byron quite a lot over the next seven and one-half months. We also thank Brian Lux for making the travel arrangements stress free and comfy. The trip in our 15 passenger van presented the perfect opportunity to get some administrative business out of the way, so they were briefed on their choice options concerning the number of hours in which they might or might not engage over and above the 60 hour program announced in their membership applications. They had a week to think about it and on the first day of class a majority of 77% voted to opt for the inadvertent over-planning of training hours. There were reservations about time commitments regarding the skills project over and above time allotted in class but with all cards on the table we decided those issues would be part of their skills project planning as teams. The next order of business for this class was to decide on their class project. Three options were discussed. Two options were offered to them and they were encouraged to come up with an option of their own. The final choice will be made in the next class but the project option they proposed on their own would be an amazing effort and something of which their class could be very proud, should they pull it off! I’ll leave that reveal for the May Newsletter. Finally, they were given two options to address the task of getting familiar with the VMN Program Sponsoring Agencies. They could choose to play Agency Jeopardy or host a sponsoring agency representative reception. They chose to host. This is a very bold and confident group we have for 2015! I seriously doubt I am going to be able to keep up with them. 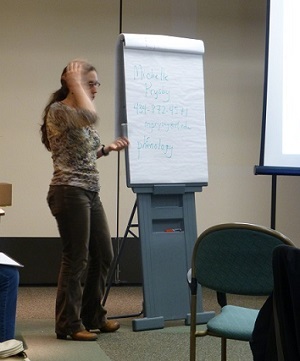 Michelle Prysby differentiating phenology from phrenology. They are a vocal, excited and exciting bunch. I do believe Michelle Prysby, Special Projects Coordinator for the Virginia Master Naturalists Program, was quite impressed with them as she listened to them making decisions before her presentation: Introduction to the VMN Program, as well she should be. They were quite impressive in their interactions with her as well. They have duly impressed me with their eagerness and ability to navigate VMN-VMS. As soon as they were set up in VMN-VMS, several were using it – without any instruction! They were forthright and honest on the new class evaluation form created in the Training Committee. No punches pulled, they paid close attention to what Michelle had to say and if the presentation did not match what the evaluation indicated – they politely but firmly noted it. I’ll need to be on my toes every minute with this class. It is quite fortunate that several members of the Training Committee have already committed to share an increasing amount of the training responsibility because I’m going to need all the help I can get to keep this fourth cohort challenged and free from boredom. But I know I am going to love every minute of it and I am sure they will too because they are primed and ready to seize every opportunity we can give them! 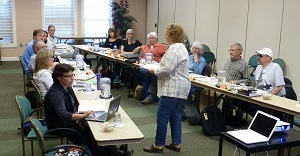 April 4, 2015 in Training.